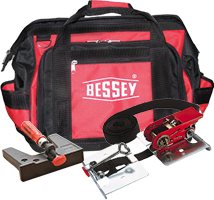 We carry Bessey flooring tool kits to install wood flooring with precision. flooring tool kits are helpful in lining up wood pieces while installing wood flooring. Our Bessey flooring tool kits will remove much of the guesswork out of installing a wood floor. Please take a look at the high quality flooring tool kits to install wood flooring below.